By this definition, Play is not the opposite of Work: it is it’s earlier incarnation. Work is the evolution of play. Small children require toys to inspire a shift into a state of play. A child without toys will find a green stick and pretend it’s a dragon. Teenagers have less need for toys because they achieve the ability to shift into a play state without requiring an orienting object. Evolved adults who no longer require the objects but are wise enough to remember their intention are able to consciously shift into a State of Play: a total immersion into an experience in which they enjoy a good degree of control. The best marketers understand that this applies to adults as well. In marketing, there are two crucial elements: the product itself and the experience it inspires. In the kids market, the object is a Toy and the experience is Play. For the grown-up, the object is Useful, and the experience Enjoyable. In both instances however, the experience of the object creates a perspective shift. 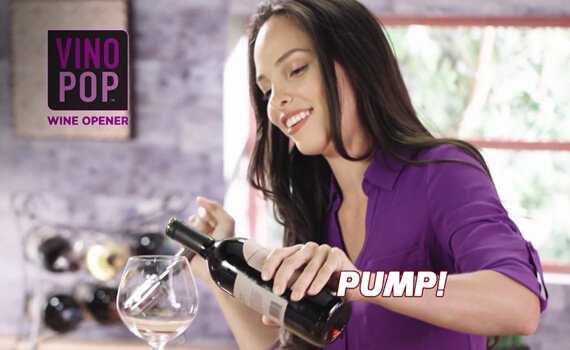 For grown-ups, there’s Vino Pop, a sliding cylinder that pushes down into a cork and brings it back with a satisfying Pop! Visually pleasing, nicely tactile. Watch the faces of the women uncorking bottles during the testimonial. The “woooooo! !” sound they make on uncorking is a sure sign that a state of play has been achieved. But that’s wine, you say. Wine puts everyone into a play state! Okay then, what about a palm-sized baking pan that’s wrapped in bacon and cooked into a crunchy edible bowl? Talk about a shift in perspective: “A bowl? Made of Bacon?! ?” Yes, making bachelor-sized single serving meals can be depressing. However, in a play state, it’s a scrumpalicious™ Bacon Bowl testament to your undeniable right to enjoy pure freedom! Hutton Miller has built a large part of their reputation as leaders in the DRTV field on their unique ability to showcase the massive fun potential of kids’ toys. Kids love to play, and a higher Play Value means an overall higher perceived value. But the truth is, adults love to play too. Yes, we may have evolved beyond the need for objects to shift our perspective into a higher state of play, but enjoying those objects is undeniably, unforgettably useful!